The Division of Haematology includes the clinical management arm, the diagnostic arm and the research that is necessary to maintain Groote Schuur Hospital at the cutting edge of service delivery. Because of this, the division is a complex unit with multi disciplinary activities that include outpatient clinics, an ICU and diagnostic and research laboratories. 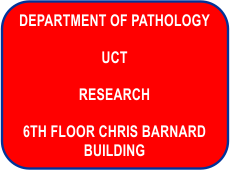 The clinical services are organised under the umbrella of the Department of Internal Medicine, while the laboratory diagnostic sections are under the broader organisation of the Department of Clinical Laboratory Sciences and National Health Laboratory Service (NHLS). In addition a University of Cape Town Leukaemia Unit established within the division, has now been reviewed and approved by the University Research Committee and will continue focusing on the area of haemopoietic stem cell biology and transplant immunology. 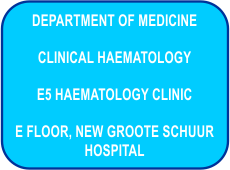 At Groote Schuur Hospital (GSH) a Clinical Haematology Division provides comprehensive services to patients with blood disorders, including haemophilia, genetic anaemias and patients with haematological malignancies. There is an active bone marrow transplant program, which is a national referral centre. Groote Schuur Hospital is the teaching hospital of the University of Cape Town and runs several tertiary / quaternary programs as well as specialized intensive care units. The Role of Haematology Pathology in the management of patients is extensive. Almost every single patient attending a clinic or the hospital, will have a haemoglobin measurement to check for anemia and many clinic and most hospital attendees have at least a Full Blood Count and often a differential count as part of their diagnostic workup. Interaction with nursing staff, doctors and patients on the interpretation of these results as well as of all the other tests within our repertoire, occurs on a daily basis. 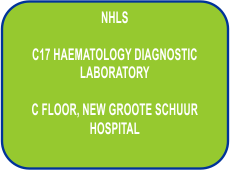 Further, as part of the diagnostic laboratories, the haematology laboratories offer a comprehensive 24 hour diagnostic service to Groote Schuur Hospital (GSH) and Red Cross Children's Memorial Hospital (RXH). The routine laboratory functions are carried out at 2 main sites - the routine C17 laboratory at GSH and RXH laboratory, while specialized investigations including cytogenetics and molecular work are performed in the C21 laboratory at GSH and in the Haematology laboratory at RXH. As a fully accredited laboratory, we have also become an established specialized supra-regional service to various state hospitals in this province and the Eastern Cape, as well as to private facilities.